The University of Alabama’s efforts in recycling are having a positive effect on both the environment and the bottom line. UA’s recycling program provides jobs, offers an economic impact through the sale of recycled material and helps to educate students, said Tony D. Johnson, UA senior executive director for logistics and support services. Tons of recycling diverted from the local landfill: 1,439.77. Revenue generated from the sale of recycling materials: $184,287.6. Landfill fee savings ($28 x 1,439.77 tons recycled): $40,313.56. Performing inhouse shredding services (free to departments): $65,560. Total revenue + cost savings: $290,161.17, or $201.53 per ton. Using the most efficient methods also counts. By baling cardboard, sorted office paper and mixed paper, the recycling program receives higher prices for these recycling materials. In addition, this process helps reduce UA’s carbon footprint by sending out a full tractor-trailer load of recycling materials all at once. UA also pursues other cost-saving methods that don’t factor into the recycling program. For example, UA works with departments so they will order less paper, and with the purchasing department to place Requests for Proposals to use a certain size pallet. Those pallets can later be sold to a vendor for $2 each. Many organizations perform bin audits to determine the amount of recycling items that go into the landfill. UA uses these processes as well. UA audits delivery trucks coming on campus so staff members can plan to recycle those items. The department gives three tours a week to students, faculty and off-campus businesses, Johnson said. 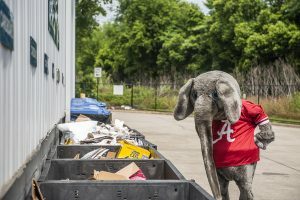 UA provides a drop-off area for both students living off campus and members of the community to recycle aluminum, paper, glass, plastic and other items. The department also has applied for grants to support sustainability initiatives. Over the last five years, UA has been awarded $291,609 in grant funds. These awards have contributed to the success of sustainability programs on campus. Organizations are encouraged to maintain records of the amount of recycling materials. 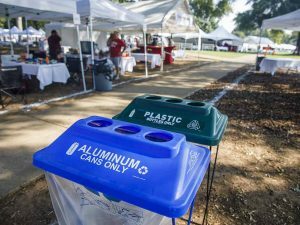 The UA Office of Sustainability has partnered with UA Gameday to increase recycling efforts and make it easier for tailgaters to keep recyclables out of landfills. On home game days look for the recycling tent, with attention-getting banners and signage. 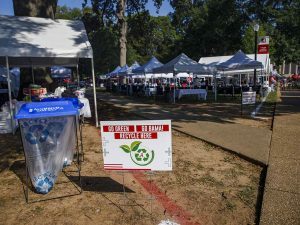 While fans can bring recycling to the tent, UA staff members also circulate among tailgaters on the Quad, offering recycling bags to fans and picking up recyclables, making it almost effortless to participate. While there are many permanently placed recycling containers across campus, the game day tent doesn’t always make an appearance. “Kick-off time and anticipated crowd size will also determine whether or not we put up a tent for certain home games,” said Tyreece Hampton, director of logistics and support services. The Office of Sustainability’s website has current data on UA’s overall recycling efforts. Hampton said the office is reviewing ways to improve the game day effort and possibly expand it to other events on campus. UA has recycled 1,438.60 tons so far this year, a 14.8 increase over last year. The City of Tuscaloosa has a glass recycling container at the Ancillary Services Building at 1115 14th St. The city accepts brown, green, blue or clear glass (but not light bulbs or mirrors). For a full list of what UA recycles and where those items can be taken, visit http://recycling.ua.edu/right.html. The Senate nominated Senate Pro Tempore Brooks Payne before voting to encourage energy sustainability on campus by reducing the University’s carbon footprint during its meeting on Sept. 13. The Senate, which also passed two other pieces of legislation before sending a final one to old business, encouraged the University to purchase solar-paneled umbrellas. The umbrellas would include charging mechanisms connected to solar panels so students could charge their devices without using electricity. Sen. Branden Greenberg, a third-year law student, and Jason Rothfarb, a sophomore majoring in political science, wrote the resolution that encourages the University to follow campuses such as Iowa, UCLA, Cal Poly and UNC at Chapel Hill. Greenberg said, by mirroring these schools, the University will be able to reduce its goal of eliminating its carbon footprint by 2 percent. Senator Rothfarb said the University could surpass its goal by implementing the solar panels on umbrellas around campus. Additionally, the Senate passed an act to approve the organizational-funding requests suggested by the Financial Affairs Committee (FAC) for the month of October. The act approved nearly 88.58 percent of the funding requests made by 20 separate organizations. The requests amounted to a total of $35,127.87. The Senate also sent a bill to bring back business professional to old business so the bill could be amended to say business casual. After the authors, Rothfarb and Sen. Logan Sheaffer, agreed they would settle for dressing business casual instead of business professional, a motion was brought forth before being properly seconded on the floor. Should the bill pass when it is reintroduced from old business, it would mandate senators dress in business casual for each meeting held on the first week of the month. Senators would also be required to dress in business casual for special Senate sessions. The Senate also passed a bill to create a deadline for student-organized seating. The bill closes a loophole allowing for appeals to student-organized seating throughout the year and only allows for organizations to appeal within the first three days of the student-organized seating chart’s release. For Nicole Conde, a campus effort that focuses on recycling is a smart idea. Conde, a sophomore majoring in nursing, said she can’t make sense of people disposing of a lot of products instead of recycling. “How are you going to find anything negative about recycling?” Conde said. Last month, the University saw almost a 48,000 pound increase compared to August 2017, when total pounds recycled was 344,340, according to a UA monthly recycling report from 2016 to 2017. Tony Johnson, senior executive director of logistics and support services, said the University recycled 195 tons – almost 400,000 pounds – in the month of August. According to this year’s report, 13,784 trees, 308,120 gallons of oil, 3,243,364 kilowatts of energy and 5,675,887 gallons of water were saved based on total paper recycled as of Aug. 31. To continue recycling efforts on Saturday, the Go Green Gameday Recycling Initiative set up shop on the southwest corner of the Quad as the center for game-day recycling. While she waited for the game to start, Conde stopped by the tent to toss the bottle she’d been drinking from into one of the bins inside. “If we’re going to use so much disposable products, we should at least attempt to recycle them,” Conde said. The initiative was active on the Quad from 8 a.m. to 2 p.m. before the game on Saturday. Recycling employees made rounds to the different tailgating tents and the fraternity section to pick up cans and other recyclables. The employees then brought them back to the Go Green section so they could be taken to a warehouse. Bags for recycling were also handed out around the Quad. “We’re trying to get our students to recycle more,” said Hazel Johnson, the facilities associate who assists with UA Recycling. Overall, Hazel Johnson said the goal of the initiative is to get students engaged in recycling to promote a green campus. For students who stopped by to take pictures with Go Green’s recycling bins, free shirts, hats and buttons were handed out. Students could also swap bags full of clean recycling, such as plastic or aluminum, for free items. Students should recycle because it is the right thing to do, and it reduces the amount of trash that goes into landfills, Tony Johnson said. He said if landfills overflow, then new ones will be built. Since landfills can hold only so much volume, another goal of the initiative is to prolong the life of current landfills through recycling. “It’s just the right thing to do for our generation and generations to come,” Tony Johnson said. The initiative’s crew gets back together to pick up more trash and recycling on Sunday morning after game days.